I am thinking a lot about stories this week. The congregation I serve, Blooming Grove Reformed Church (RCA), as part of its bicentennial observances, is having a “Storytelling Sunday” this week: after worship, over a pot-luck lunch, members will be invited to share stories of ancient and recent life in our congregation and our community. We’re doing it because the best of history is wrapped up in story, and because there is a way in which storytelling, more than any other endeavor, gets at the essence of who we are. Jesus never gave a systematic theology lecture in the gospels. He does very little, if any, didactic doctrinal lecturing. But he tells a lot of stories, and I think I know why. That which is didactic engages the listener in left-right, right-wrong, yes-no, binary sorts of thinking; the conclusion is that this is either true or false, and very little room left for any further discussion. Given that God is bigger than we can possibly understand or express, such limited modes of expression make things that much more difficult. Stories, on the other hand, engage the imagination. They open the mind to various possibilities and myriad ways at looking at the stories which give prominence or special significance to different aspects of the same tales by different people, or even the same people at different times. We can hear the parable of the wedding banquet from the perspective of the host, the servants, or the invited or disinvited guests. We can look at the great gulf in the story of the rich man and Lazarus as metaphor for a number of different realities in how we fail to relate to God or each other. And what is wonderful is that all of these interpretations, all of these perspectives, reveal a truth about God and God’s Reign. Even when these viewpoints contradict one another, we can find God in the paradoxes. Allen Janssen, who teaches Reformed theology at New Brunswick Theological Seminary, recently suggested that using doctrine to define unity is a weakness of the Reformed tradition. Doctrine is valuable, of course, but we cannot find unity in doctrine, because there will always be points to disagree about, as is witnessed by the continued splintering of Reformed denominations. Janssen points to the sacraments—particularly the Eucharist—as a place to find unity; we are one in Christ around the table, especially when, as Calvin suggests, we simply accept the mystery. This makes sense on two levels: first, those of us who remember big family dinners—once a regular Sunday event at my grandmother’s house—know that we can love people whom we do not truly like; second, the Supper is, at its heart, a story wrapped around a mystery; hearing it, sharing it, and acting it out open up more and more realities of God to us. 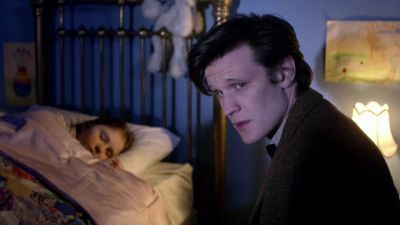 At the end of that “Doctor Who” episode, the little girl grows up and remembers the stories and, through the stories, makes the Doctor real in her world again. Through story, we make Christ more and more real . . . and we make ourselves more real, too. Touching our hearts as we pass it along. A good reminder to you story more than I use doctrine in my work.